One of the hidden costs in the managed print services industry is the customer cost of interruptions of End Users and Help Desk tickets. Printer gets low on toner, End User tries to print, device notifies End User of low toner or replace toner cartridge (which usually means that the factory default setting of 20% or greater has been reached), End User is interrupted from task and notifies (opens a ticket with) Customer’s Help Desk and Customer’s Help Desk relays message to the team in charge of toner refresh. 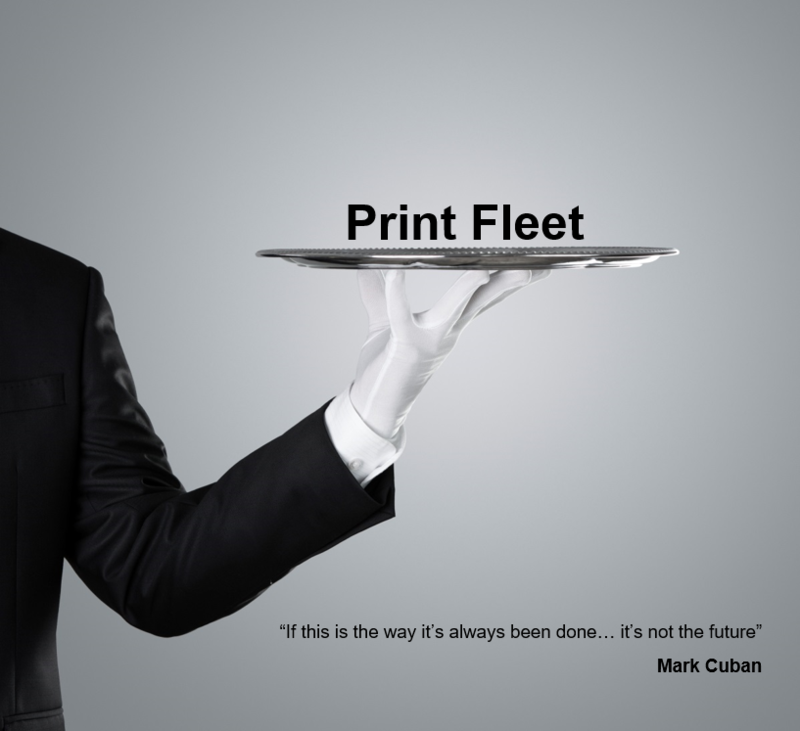 A business has 2600 networked devices in its print fleet. Their Help Desk is averaging 450 calls a month on toner refresh (toner replacement) alone. That means not only that their Help Desk is fielding the calls, but their End Users (employees) are interrupted 450 times a month to deal with toner in printers. They know that their cost of one Help Desk ticket is $28 and their End User time to be involved costs them $9 (fully loaded). That’s an annual hidden cost of $200,000 to the business—-in addition to paying for a “full service” Managed Print Services (MPS) vendor. We recognized this significant cost and so did Customers asking us to eliminate it. So, we developed advanced automation to address it including forecasting algorithms that estimate the time to outage (based on historical data, known yields & many other factors). Our automated solution forecasts the time to outage and puts the necessary action items in “360 Degree View Pick Lists” for the managed print services provider workforce. The Service Provider acts proactively and the End Users are not interrupted and the Help Desk tickets are avoided. The Customer is removed from print service delivery—and so is the cost. Thresholds of forecasting can also be set and adjusted to maximize toner usage to avoid waste. Inaccurate billing causes unnecessary cost and the current industry wide approach to billing is fraught with inaccuracies. Whether you’re billing costs internally to departments, being billed by your MPS provider or are an MPS provider, billing accuracy is essential. Inaccurate billing adds labor costs and causes costly business turbulence. Inaccuracies are caused by industry-wide challenges arising from inaccurate device inventory, inability to leverage automation to read meters, manual effort to justify multiple data sources, device click count anomalies & manual effort required on tethered (USB connected) devices and many others. Our advanced billing system addresses these industry-wide issues with automation instead of manual effort. The foundation for accuracy starts with our comprehensive, accurate and available (evergreen) device inventory–which is essential for cost (and risk) elimination. If you can’t find it, you can’t bill it. Print Device Asset Life Cycle Management is necessary. See below. We report enterprise volumes on all meters on all devices regardless of make, model or location and make those available 24/7/365—not just at the end of the month. We built in automation to address false reporting of volumes by multi-function printers. This false reportings are referred to as “click count anomalies” and are well-documented industry wide—regardless of manufacturer. With our solution, anomalies are alerted to help identify and remediate them before billing. Often, large multi-vendor fleets are serviced by multiple service vendors or there are multiple sources of information about the print fleet. Time and effort is wasted (labor costs are increased) justifying the different data sources for billing. We provide comprehensive facts about all networked imaging devices in the field of scan regardless of make, model or location and thereby establish one single source of record that can be readily used for accurate billing including when multiple managed print services vendors service the same enterprise. Our solutions also include technology to inventory and read meters from most USB connected print devices to eliminate the cost of manual effort and associated inaccuracies. See below. Businesses incur costs of employee time, contractors and projects when they can’t answer questions about their print fleets and print service delivery. Our solutions provide complete print fleet device inventories, statistics, trending and details that are available as they occur. Analytics range from enterprise image counts (“click counts”), volume and fault trending, fault state by device, time to fault resolution (uptime) and many others including “Top 10” lists. Customers use this rich information for activities such as monthly bill preparation, monthly bill auditing, support for technology refresh or technology consolidation/optimization, RFP development, contract negotiations and many other uses. Customers also use this valuable information to optimize the fleet, optimize by location and compare usage to manufacturer recommended duty cycles or set their own…. and many other cost reduction uses. Fleet cost analysis is at the core of cost reduction and optimization. We provide analytic capabilities that enable businesses (or their service providers) to compare costs by many different factors such as cost by utilization (e.g., over/under), performance (e.g., compared to SLAs), by manufacturer, model, location, print type, supply usage and/or uptime including costs per click, cost per cost center and total cost of ownership (TCO). Our concierge teams are also available to report costs in different custom formats. To provide the facts about what is actually being printed by whom and what can be changed to reduce cost, we can monitor all printing from up to 200 workstations (per server) in a high paper usage department. We maintain the metrics about the makeup of the fleet, including current and historical inventory, volumetrics, uptime/downtime and many other metrics by make, model, manufacturer, location, department or enterprise. Businesses use these metrics to better create requests for proposals, manage their vendor relationships and renew. We provide reporting on uptime of devices (not just managed service providers’ response time). The current MPS industry-wide approach is based on service levels judged by response time to tickets using Customer’s Help Desk. However, the more accurate measure of service levels is based on actual uptime of devices— (i.e., when are they available to be used). Uptime is checked at both the network availability and device levels. Also, reporting can be adjusted to account for different MPS provider uptime service level agreements by location, day of the week and others. Our service level agreement (SLA) management module allows our concierge teams to monitor and report on current and historical performance against your chosen metrics. We measure enterprise print management system performance, availability and reliability by using quantitative measures such as frequency of breakage, time to repair, and can provide an overall source of record for system availability and responder performance. The single most important aspect of effective print fleet and print service cost elimination is establishing and maintaining accurate device inventory. Accurate device inventory is the essential foundation for all cost elimination efforts in large print fleets. Inaccurate inventory adds unnecessary cost to billing, device service delivery, fleet optimization, purchasing of supplies, and many other print service delivery activities. The current industry—wide approach involves multiple spread sheets with extensive manual effort to justify, incomplete inventories from 1990’s type scanning capabilities and techniques, “walking human repositories” of inventory knowledge, no single source of record and many other inefficiencies—all adding great additional, but unnecessary cost. Our advanced technologies provide up-to-the-minute inventories of print devices, regardless of make, model or location including multi-function printers, printers, scanners, faxes, fax servers, etc. We address multi-vendor, geographically disparate enterprises with ease. We delivery true Device Lifecycle Management (cradle to grave), not just periodic device scans. Our solution tracks devices through “dead or alive” status change and changes in device location, device configuration (e.g., mother board changes), IP address (e.g., DHCP) and network configuration. We’re able to track each device throughout its lifecycle on your network. We provide inventory and device details about all networked imaging devices in the field of scan including newly acquired locations. You use those facts to make decisions about how to best standardize, consolidate and remove cost. Our evergreen inventory includes comprehensive detailed configuration, life cycle, supply and other information about each device. Everything but color of the box. Today’s industry-standard MPS delivery includes manual communications from 1) Customer to MPS provider about the consumable or trouble, 2) MPS service delivery manager to parse out work to technicians each shift and 3) manual communications regarding resolution of the consumable outage or trouble. We call this “swivel chair integration”. This manual parsing of work approach necessarily increases labor costs, business downtime and the likelihood of error. We listened to Customers & automated this manual process to eliminate the cost. Our technology scans the network, applies advanced algorithms & automatically produces “360 Degree View Picklists” per shift to enable truly proactive service. Then, we automatically match the device service need to the technician with the capabilities to perform the required service and send the picklist directly to the technician before his/her shift begins. The picklist includes not only service action items such as forecasted toner refreshes or preventative maintenance, but also any other upcoming or required service actions. It gets even better. Each picklist is optimized not only by technician but also by location. Our picklists are called “360 Degree View” picklists because they provide the technician with actionable information not only on the subject device but on all surrounding devices in that location to optimize their effort with automation. Printers that are USB connected to computers (tethered) represent considerable cost that can be reduced. Costs range from the very existence of these often-low cost devices to uncontrolled toner purchases to manual effort (& corresponding end user interruption) required to walk around and make manual meter reads. We offer several different technology options to reduce manual costs of tethered print devices. These options include 1) regular agentless scans, 2) 24/7/365 workstation monitoring or 3) a new cutting-edge software agent that can be installed on the workstation.
. . . there are many other High Impact Uses.